Fishing lakes and ponds? Give this fly a try. The second featured fly of our fourth fly swap, which was sponsored by Tim at Yagers Flys is from Tim Stewart. 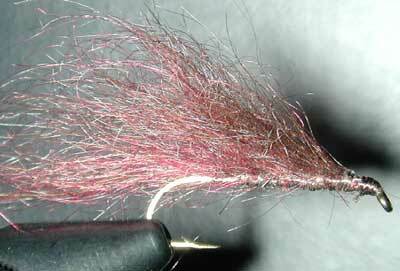 The Mohair Leech, which is very simple to tie, is also very effective on lakes and streams according to Tim. "Cast the fly out and let it sink. Slowly bring to the surface, or raise your rod and then relet it sink back down and repeat. I have cought fish with hardly any mohair left on the hook. The fly does not have to be pretty to catch fish. I find that I catch so many fish with this fly it is almost too easy." Tie this fly sparse. Tie in small bits of the Mohair yarn that you pull apart. Whip finish the head.